It’s the first week of Season 9 of Project Run & Play and this week’s theme is Put Me In The Zoo. 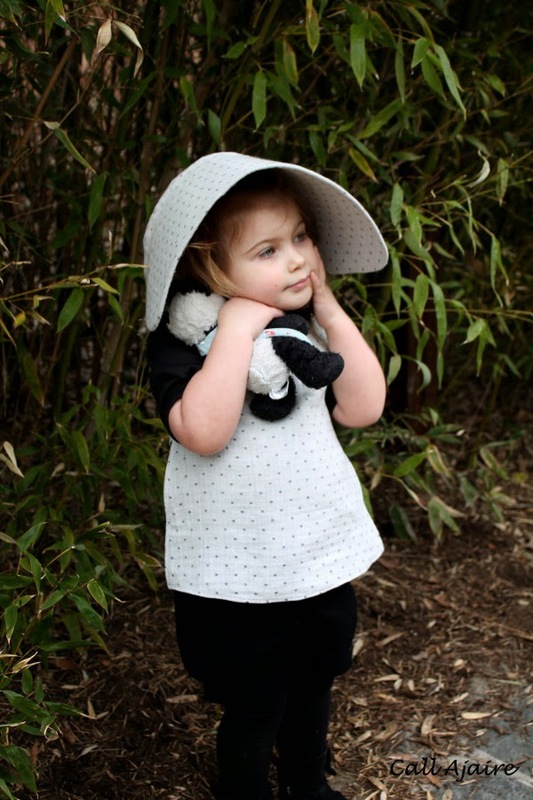 If you like my outfit, please take the time to vote for my Sunbonnet Panda Pinafore before Thursday night! Well, we all know Bean is in love with anything panda (check out the #allpandasallthetime hashtag on Instagram to see how nutso she really is about them), so it was a sure bet that I’d use pandas as my inspiration for this Put Me In the Zoo theme. I decided to use the basic color blocking of a panda as the inspiration jump-off point. 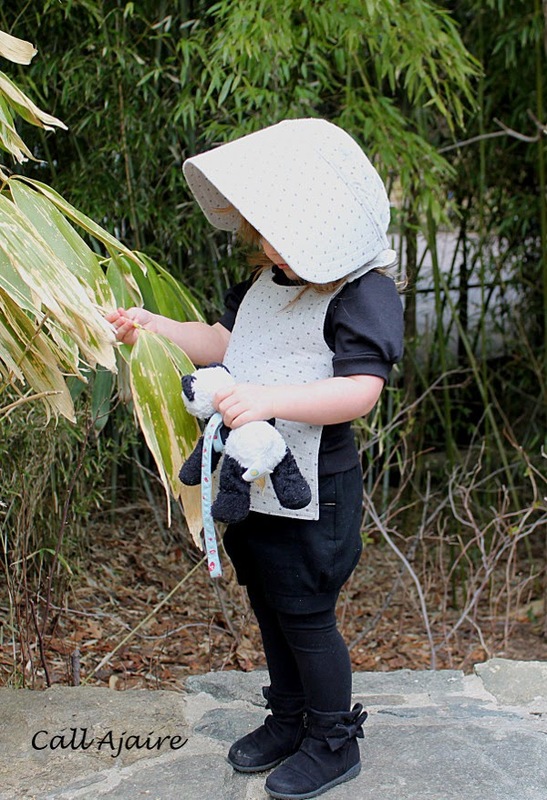 I designed a backless pinafore with a sunbonnet attached that would cover all the white areas on a panda’s body. 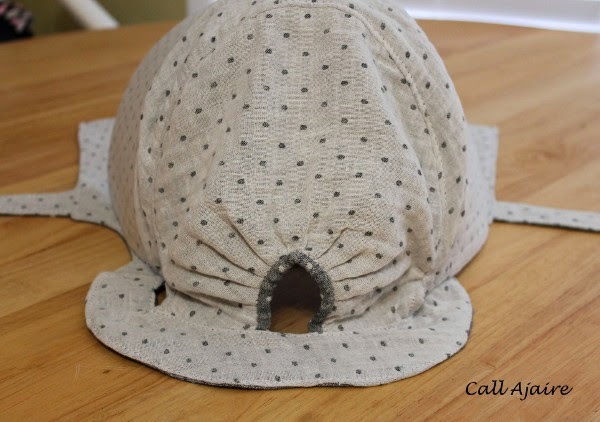 Over-exaggerating the sunbonnet made it extra cute for summer wear. 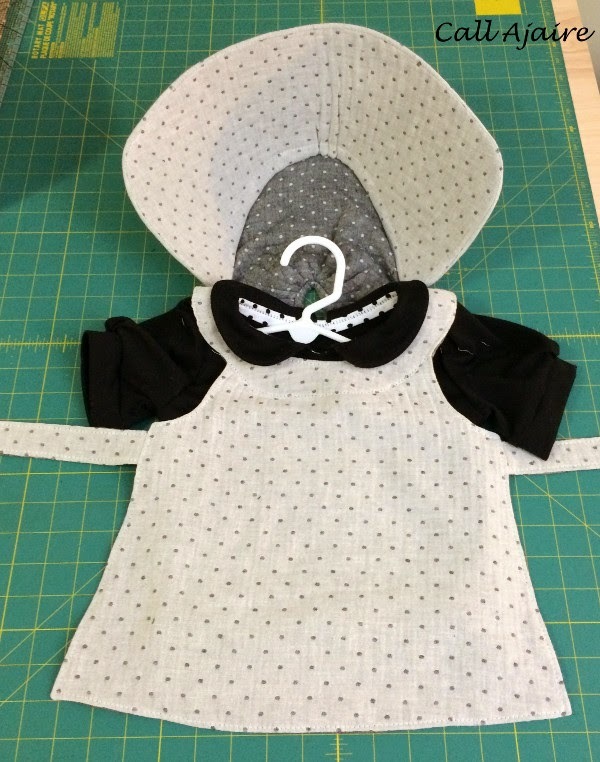 I had never made a sunbonnet so drafting one that didn’t need a chin tie was no easy task, but I’m so pleased with the result. 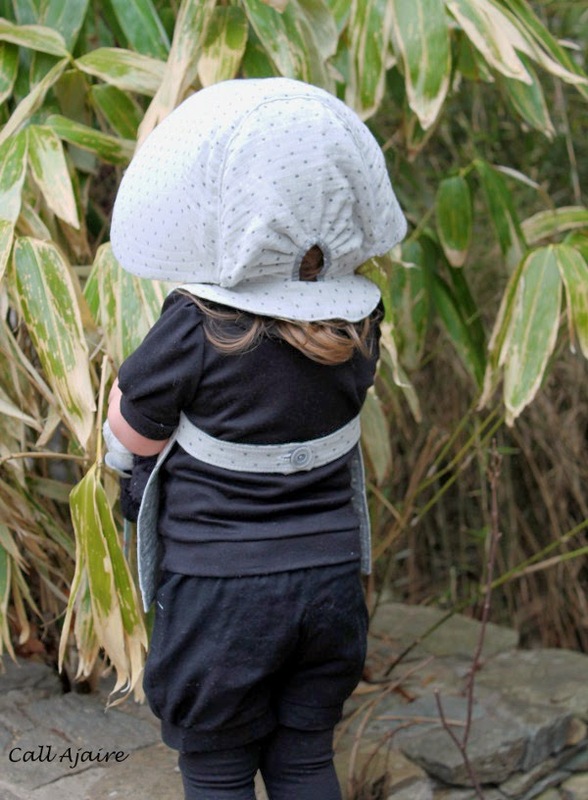 The sunbonnet stays put while it’s on Bean’s head, but she can also flip it back if she doesn’t want to wear it, without having to ask someone to untie it for her (or half choke herself in the process). 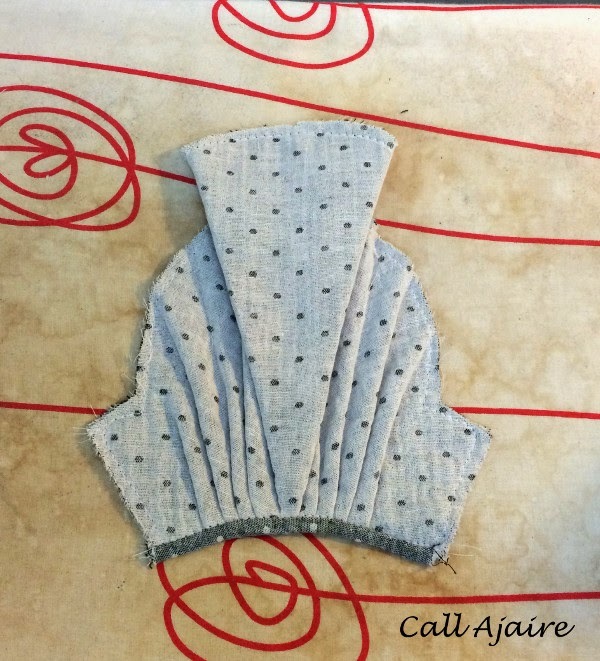 For the sunbonnet, I drafted a crown that would extend down to the neck. Instead of gathering along the bottom edge, I wanted to the crown to fan out from origami-style folds along the bottom. After a few muslin mishaps, I found the perfect shape. 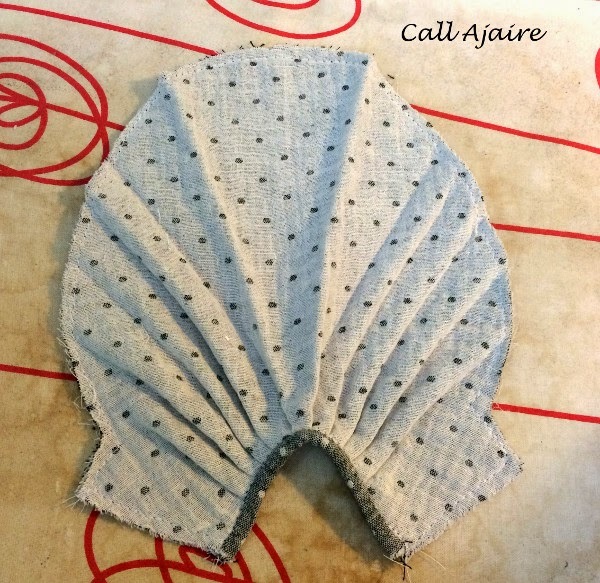 Starting with a shape like in the picture above, I pressed folds on either side of center and then attached a piece of bias binding to the bottom edge to hold the folds. 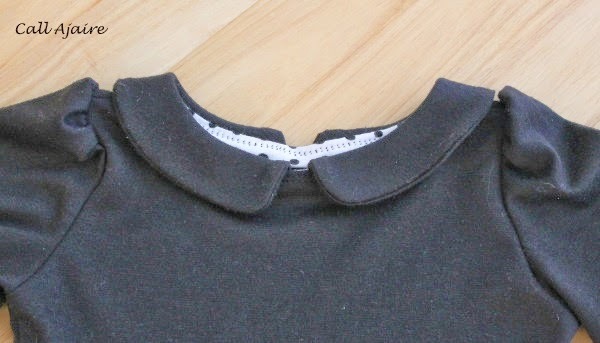 By taking the binding edges and curving them to touch, the bottom edge becomes a keyhole opening at the nape of the neck and the new bottom edge (to the left and right of the binding in the picture above) gets sewn into the neckline of the pinafore. This origami shaping creates a curved crown that holds its shape on Bean’s head without needing a tie to the front under her chin. For the over-sized sunbonnet brim I sandwiched some thick interfacing inside the fabric and ran some quilting lines along the edges. 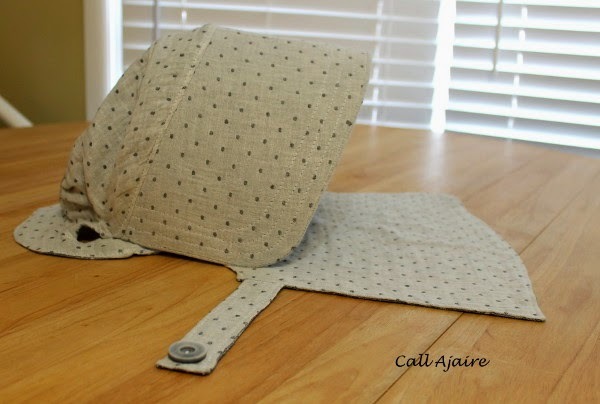 The interfacing helps to hold the brim shape while still being able to use a light-weight fabric like this soft polka dotted two sided double gauze. She’s not a huge fan of hats, so this is my way of easing her into some head protection from the sun this summer. The pinafore is backless and secured in the back with a buttoned strap. 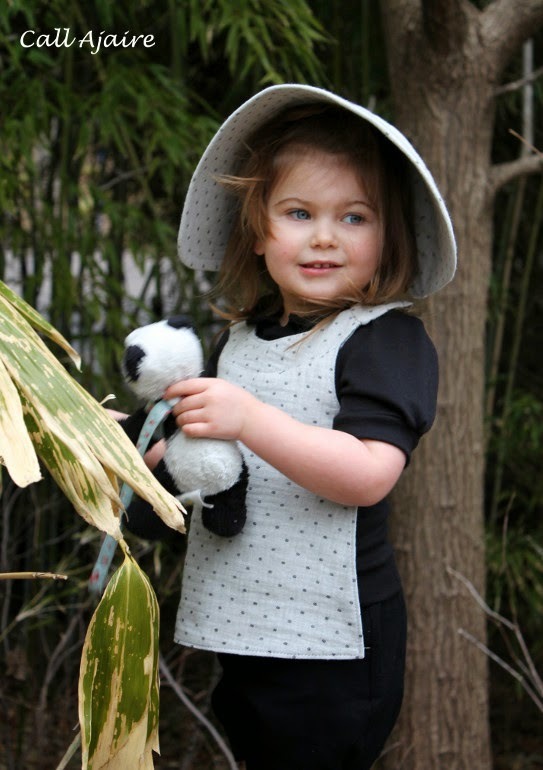 This Sunbonnet Panda Pinafore is meant to be worn with a shirt for some sun coverage or on its own on those warmest of summer days we get here in Maryland. To go with the pinafore I drafted a cute shirt which would be able to stand on its own and not just be a layering piece. I added puffed short sleeves, gathering the sleeve at the band as well for a little girly flair. 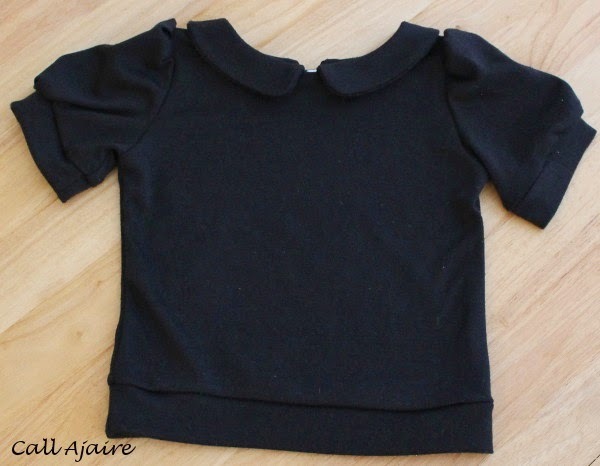 I used black ponte de roma knit fabric with a piece of polka dot knit jersey to bind the inside Peter Pan collar neckline in sticking with the panda color theme. The banded bottom also helps to make it stand out from a basic t-shirt. 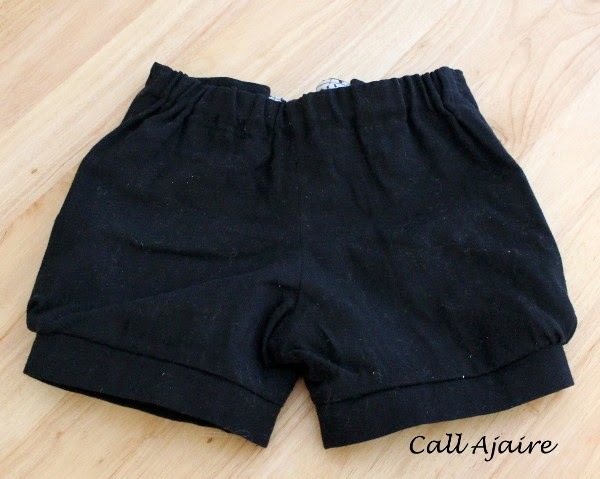 The shorts started out as a pair of Oliver & S Sailboat Pants, but I cut the legs off to about a two inch inseam, gathered the outside legs, and added a band to make them bubble style shorts. 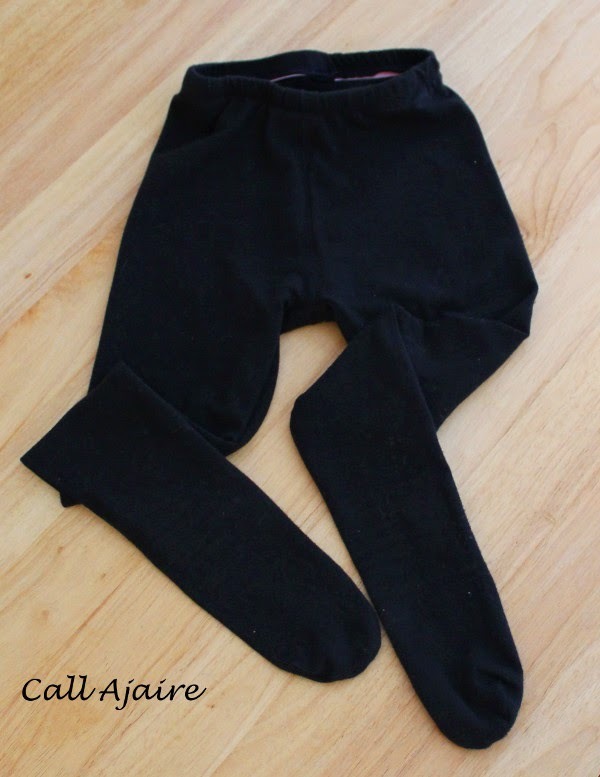 The fabric is a black double gauze that will be nice and airy for Bean to wear this summer. 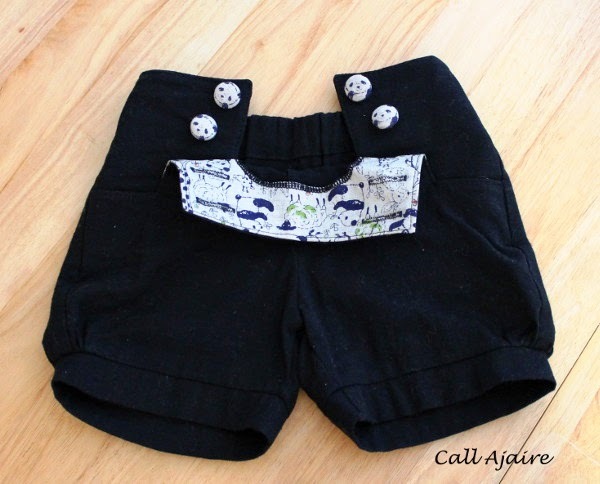 Of course I added some panda fabric to the shorts’ facing so there is a fun surprise for Bean when she takes them on and off. I used the same fabric, fussy cutting the panda faces to make the panda buttons too. I love how the banded leg changes the look of the sailboat pants. I’m a big fan of bubble shorts, so these will get a lot of use this summer. When Bean was a baby I drafted a pair of tights. To complete the panda color-blocking I had her wear a graded up pair of black jersey knit tights. It has been incredibly cold here this winter so the tights were a necessity for the fun photo shoot we had at the zoo. It was a balmy 60 degrees that day which felt like summer compared to the surrounding days of 20s and 30s, but still too cold for shorts. We are lucky enough to live close to the National Zoo and since admission is free we get to go pretty often. 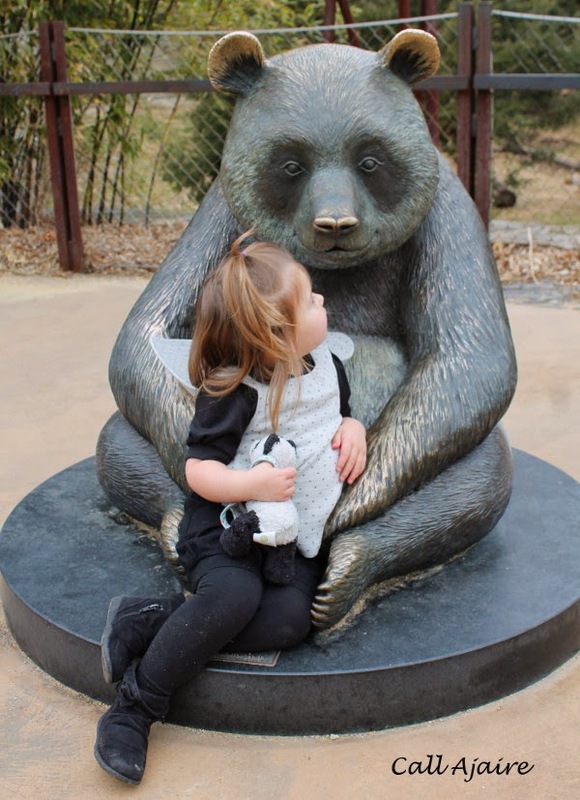 Bean was so excited to see the pandas and introduce her Pammy Panda. We had so much fun taking pictures around the bamboo at the zoo. Bean did a great job feeding Pammy the leaves, hehe. Though we’re expecting another big snow storm today, I am ready for the warmer weather. Doesn’t Bean look adorable in just the pinafore and shorts? I love how open the back is without the shirt underneath. By next year Bean will have lost more of that baby chub, so I’m taking in as much chubby arms and legs as possible while I still can, hehe. I hope you love this look as much as I do. I’m so excited to be part of Project Run & Play this season and would love to stick around to show my week two look. 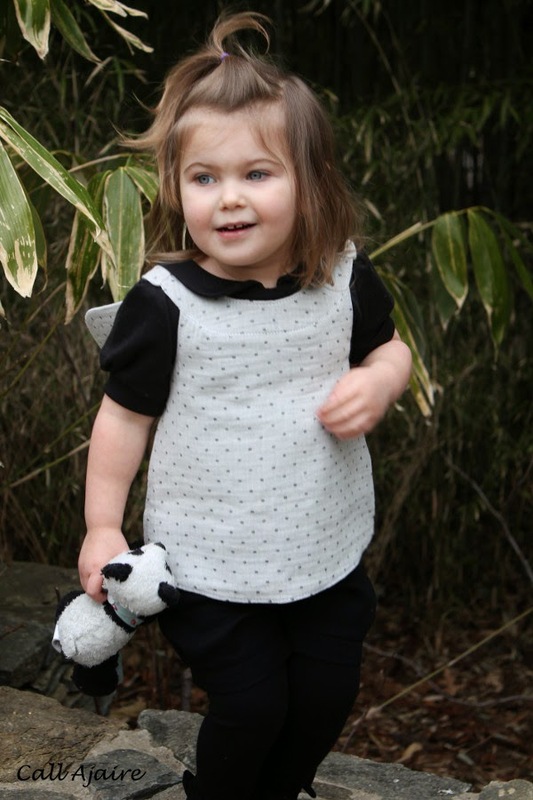 If you would like to vote for my Sunbonnet Panda Pinafore, you can do so here before Thursday night. Thank you in advance!! I love that bonnet and pinafore! Super adorable! Great job! I love th picture where she's standing in the o of Zoo! Most adorable panda ever! I love the pinafore/, shorts, and top! So very cute. I'm impressed that you actually made tights too! Love pandas so much. My nursery was decorated in them when I was a baby and I still have one that a friend of the family sewed up for me. I was obsessed with them as a child. beautiful work! I love it. She is ADORABLE! I really like the shorts they would go with anything. Thank you Raphaelle! Your cat was super cute too 🙂 And I think pandas will stick with my girl for a long time. She is quite taken with them. Thanks Rachel! The design of the bonnet was tricky, but I was determined to have it stay up with origami shaping vs a tie around the neck and it worked out so well! It's really cute in person. I love it! I was hoping to see it shirtless too, good job! Every single detail is awesome, down to the covered buttons. This outfit is so cute but all function too-FABULOUS WORK!!! The fabric is so nice and light which will be great for the thick summer heat we get here. Thanks for coming by! The shirtless option kills me Amy. Little kid backs are the cutest 🙂 With the bonnet up and the back open she's pretty much the most adorable ever. I only wish the weather was warm enough to get some good pictures of it. And we probably would have gotten some strange stares if I took them at the library while it's snowing outside haha. PANDA's! Don't you just love them! Beautiful Work! So so cute. Your daughter is so beautiful. I just love what you created, the pinafore is genius. Love it all. What a great take on the panda. In love with the bonnet. Job well done! I can't decide if I like the bonnet or the little black shirt more! So darling! It's probably that she's sort of looking back over her shoulder. Gorgeous, I love the fabric choice too! Oh this is just sooooo cute!! 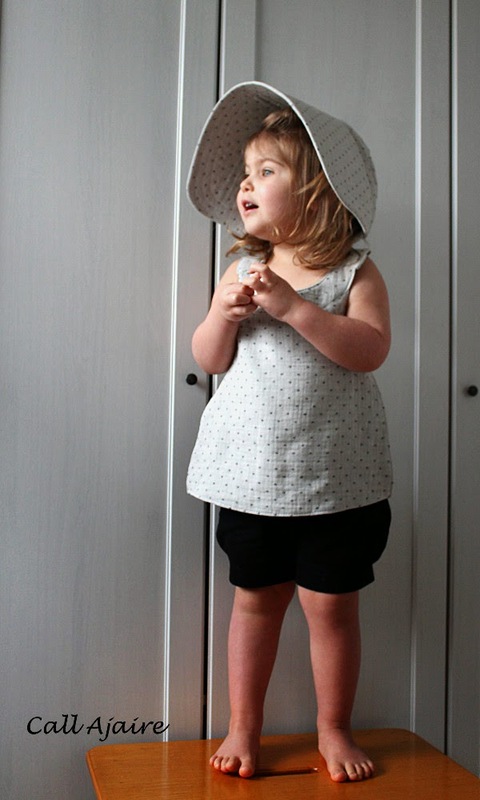 How clever the bonnet/pinafore, totally perfect for these hot summers!! FYI, we were at Ikea yesterday and H found a big panda there, he told me that his panda needs a daddy 😉 I told him that he had to wait for his birthday, mean mama! Anywho…I thought of you and #allpandasallthetime Excellent job!!! Oh my goodness! The whole outfit is so sweet, Ajaire! I adore the bonnet and the bubble shorts. 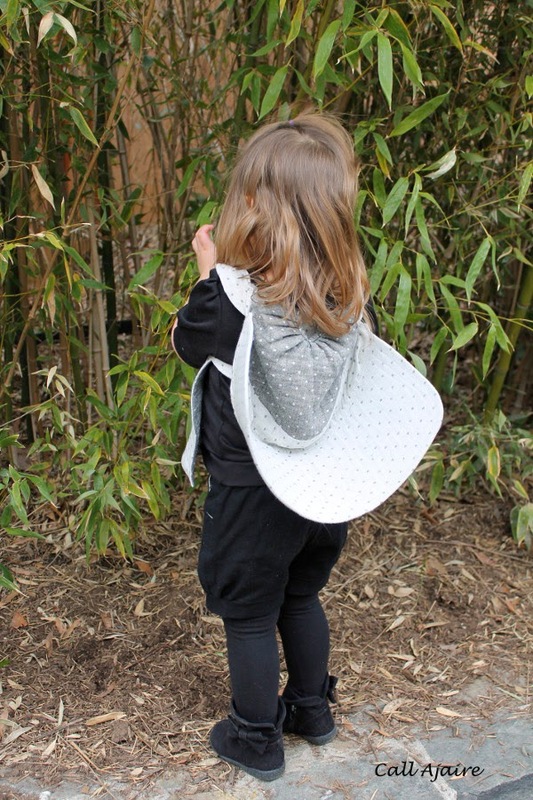 They're just perfect for a day spent visiting the pandas! Bonnie, thank you! 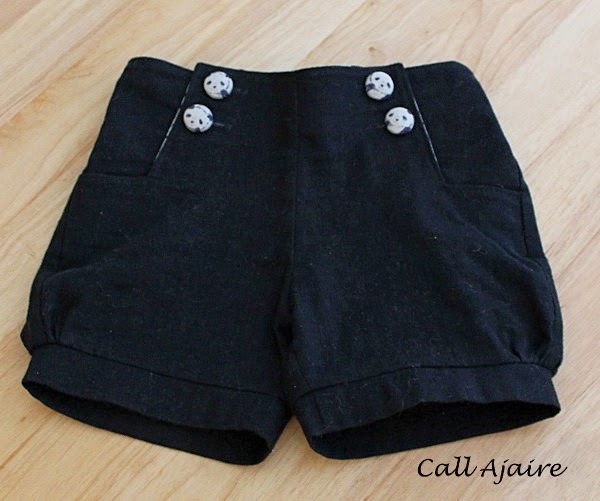 Bubble shorts were my summer 2013 obsession and it doesn't seem to be going anywhere soon. I'm so glad you like the bonnet! well done! love that the pieces come together to make a cohesive look but can easily be worn separately. 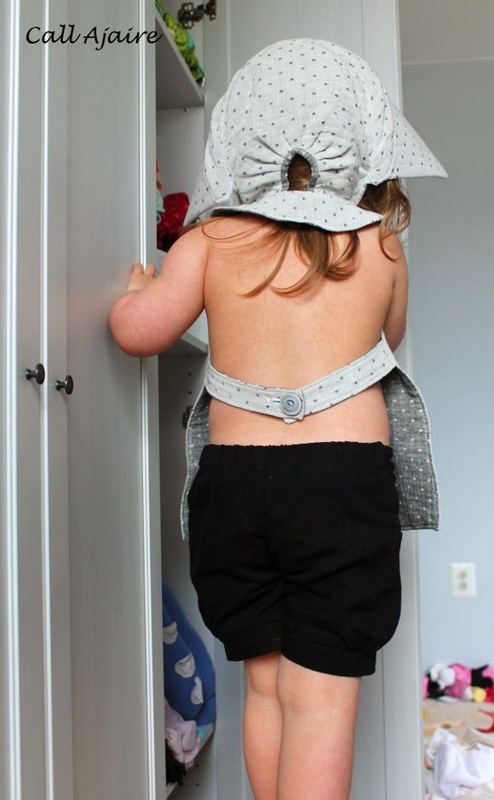 This Little Bo Peep outfit is the sweetest thing! It is just so darned cute. That hat! That pinafore is genius! Absolute genius. Love all of it!! But how are our babies getting SO BIG!!!?? Thanks Monica! They are changing so quickly at this stage aren't they? Wait until you see this week's look. She looks 25 haha. Haha Magda, we cannot go wrong with pandas 🙂 I haven't tried Marta's shorts yet, but I love the look of them. I'll have to try them this summer!